Scintilating vocal music from the Pasific Rim featuring composers and poets from China, Japan, California, New Zealand, and Australia...and one ancient Anglo-Saxon Seafarer. Unusual and lovely music sung Ars Nova Copenhagen and concuctor Paul Hilllier, and with the early harp virtuoso Andrew Lawrence-King. Anne Boyd’s As I crossed a bridge of dreams…with its rapt sostenuto, steals the show. Almost endlessly sustained, immaculately imagined, and—like everything else here—admirably performed. "Ars Nova sings with alert musicality"
Ars Nova Copenhagen sings with chaste but warm tone, smooth blend, tonal precision, and alert musicality under the leadership of Paul Hillier. This is an album that should be of strong interest to fans of new choral music from off the beaten path. Anne Boyd’s “As I Crossed a Bridge of Dreams”…grabs the attention. Based on the whole-tone scale, the music moves very slowly in deliciously textured, monumental chords that show this world-class choir at its best. 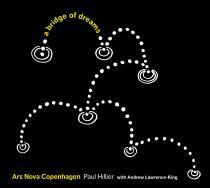 Ars Nova Copenhagen is a peerless chamber choir, directed and conducted by Hillier, with the necessary technical and musical skills to adapt to a myriad of contemporary vocal styles. (...) Lovers of choral music should not miss this inspiring programme, given a typically superlative performance by Ars Nova Copenhagen (...). Unmissable.